This, I can assure you, is a completely true story which happened in the heady days of the summer of 2012 during the Middlewich FAB Festival. The scene is the White Horse public house in Lewin Street which, like many of the town's pubs, was playing host to some of the festival's fringe acts. Mindful of the need to ensure the safety of its customers the pub's management had helpfully put this warning on a boarded-up window so that no one would trip over while trying to negotiate the entrance to the pub and its beer garden. Whether this had been done specially for the festival I don't know, but the last time I visited the pub the sign was still there. Late on the Saturday afternoon I walked into the bar and was intrigued to hear the bar staff laughing uproariously and, from time to time, mentioning the words 'uneven surfaces'. When I asked them what was going on I was told that, earlier in the afternoon, a folk festival visitor, complete with anorak, pewter tankard, Festival Guide and perplexed frown, had called in and asked them what time The Uneven Surfaces were playing. He could not, he said, find any mention of this particular band in the Guide. It is unclear whether or not the Please Take Care was a later addition to the sign, possibly designed to make its purpose clearer. Perhaps it was already there when this hapless festival-goer wandered in from the street? If so, I wonder if he thought that Please Take Care was The Uneven Surfaces' support band or that The Uneven Surfaces were such a wild and dangerous bunch that care should be exercised when watching them? Sometimes the truth is indeed stranger than fiction. 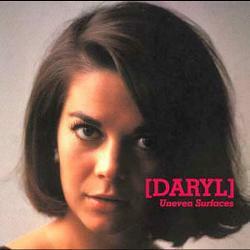 OK so the band is called Daryl and the album is Uneven Surfaces, but you couldn't write this stuff! Note: After years of struggling to survive, the White Horse finally closed its doors for good on the 10th March 2018. The only reason for the pub's decline was its position on Lewin Street where heavy traffic roared perilously close to the front door. Had the pub been in a better position there's no doubt that it would still be open and thriving.